A PIANO TECHNICIAN WITH EXPERIENCE AND INTEGRITY WHO WORKS WITHIN YOUR BUDGET! Although I have recently purchased a Civil War era Victorian and moved to Norwalk CT, I am only an hour from Times Square, so I’m still totally involved and accessible to the Greater New York area. This website and this business are all about old pianos. I call it the “Victorian Piano” because many of my “patients” have been instruments made, literally, during the reign of Queen Victoria – who died in 1901. However the “golden age” of pianos in the United States was the 1920’s, when approximately 8 major manufacturers were slugging it out for supremacy, and West 57th Street in Manhattan, ajacent to Carnegie Hall, was highlighted by piano showrooms. It was an era of wonderful pianistic talents, Ignace Paderewski, Sergei Rachmaninoff, Josef Hofmann, among many, whose endorsements were solicited by the piano manufacturers. In case you were wondering , the companies were Steinway, Chickering, and Knabe, which were founded before the Civil War, Mason& Hamlin, Sohmer, Hardman, and Weber which were started in the 1870’s and 1880’s and a relative newcomer , Baldwin. Each of these makes had their own designs and manufacturing techniques [all protected by lots of patents] and their own distinctive sound. Before the days of TV [and even radio], everybody had a piano, and many less famous makes than those listed above, turned out quite decent pianos for home use. 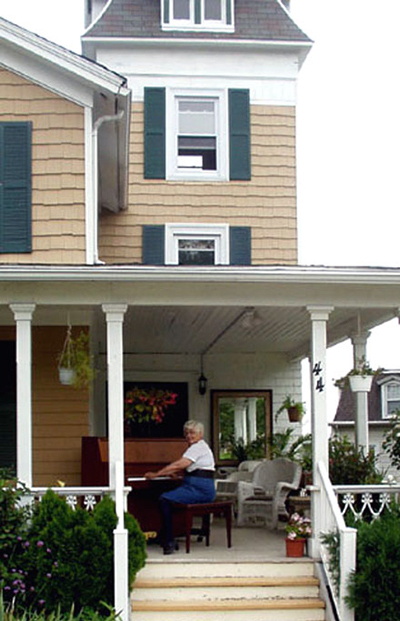 Until 1930, the standard living room piano was a fullsize upright [about 52”tall] with grands for higher end folks. The truth is that even the “no-name” pianos from the ‘teens and 20’s were often very decent quality instruments. During the Depression, pianos downsized too, literally becoming smaller. The 6’ + parlour grands were replaced by 5 foot baby grands, the big uprights by 40 inch tall spinets and consoles, but many pianos were still handmade, with matched pattern veneer and real spruce soundboards. That’s why “pre-WW2” is the catchword for piano restoration. The piano industry as it existed then has disappeared. This quality cannot be duplicated in a new piano except at the higher end of the market, as the majority of inexpensive pianos are being mass produced in China out of raw wood and chipboard. I have been doing restoration on these wonderful older pianos for many years. There is nothing like reconstructing a real ivory keyboard using salvaged pieces, and repairing a spruce soundboard with shims cut from deceased soundboards and putting it all together to get a complete piano with a wonderful resonant sound. I love to feel as if I have saved a piece of history from the dumpster.